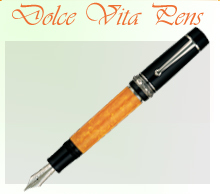 Delta pens are an Italian quality brand of pens. We are clearing our remaining Delta stock, for full Details of Delta products please visit Delta pens manufacturing website. The Delta dolcevita instruments are the result of Delta's traditional handcrafted production. In additionthe classic version in a combination of orange and black resin, hand turned frim solid bars. The Dolcevita range has versions available in both 18kt gold trimmings and 925% sterling silver. The Stout, medium and mini include a fountain pen, roller ballpoint and mechanical pencil in their range. Undersize is available only as a fountain pen, ballpoint pen and a roller. Oversize is available only as a fountian pen and offers a pen support beautifully designed in black resin as well as an inkwell. The Delta Vintage writing instruments are made with special resin turned by hand from solid bars and trimmings in special metal alloys, polished to a mirror like finish, gold or platinum plated. In the extremity of the cap a small medal featuring Delta's logo is offered. 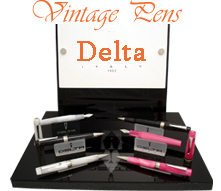 All writing instruments from Delta's collection are offered in elegant cases. Copyright @ 2009, www.gbapen.co.uk, All rights Reserved.